Burbank, CA – America's first and only museum dedicated to the martial arts, the Martial Arts History Museum, teams up with international publishing firm, Sidekick Publications, to bring global exposure to their arsenal of martial arts history books. Sidekick Publications, which is considered one of the leading distributors of martial arts books, is headed by Allen Woodman and Alan Goldberg, will be carrying three of the Martial Arts History Museum's most popular books, Museum: How it all Began, Monkey Kung Fu: History & Tradition and the Museum Honor Awards coffee table book. 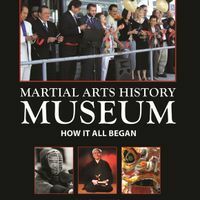 The Martial Arts History Museum was established in 1999 as a traveling exhibit and settled in the city of Burbank three years ago. It is a non-profit 501(c)(3) organization and is supported by donations and contributions. For additional information, visit their website at Mamuseum.com. Sidekick Publications information is available at http://www.sidekickpublication.com/books.html.